Instead of spending hours trying to find the appropriate sites about Moon phases, here is a list of my bookmarks for you to learn more. The information in this article was collected from several of these Websites, what my mother taught me, and from books that I read often. To respect their work and all that they have contributed to the world with their immense knowledge, their addresses and short blurbs are provided below. Learn from the experts, but remember to bookmark this site, because unless you right-click your mouse to open a new window, you will leave this page (The 8 Phases of the Moon). If you have any suggestions for a site that should be included here, just email me with the details. Thanks! A NASA Portal publication that is fun reading. I include it - even if it isn't only about the phases of the Moon - because it is very professional and scientific. The Moon, as Shakespeare suggests in Romeo and Juliet, is fickle. Its complex orbit moves it swiftly across a wide tract of the night and day skies, changing its appearance continually in both bold and subtle ways. As it waxes and wanes its features alter dramatically—rugged heights can turn to pale ghosts, tiny blemishes can become brilliant beacons, and thin beams can briefly shine across the lunar twilight. With Inconstant Moon as your nightly guide you can explore Earth's ever-changing companion, and discover some of its strange phenomena. Witness the disappearing act of the massive crater Maginus, learn how the interior of Curtius may hold the dark key to the Moon's past, and see what makes Wargentin such a bizarre freak of nature. This site provides tables for Moon phases through 2007. The Old Farmer's Almanac is one of the best ways to see just how the Moon affects our lives daily. 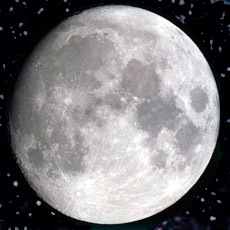 At the Farmers Almanac site, full moon names have a complete description. It's fun to read. After astronomy shown above, just add /fullmoonnames.html instead of just 'moon' - to get to the right page. For beginners, the motion of the Moon. Great images, graphics, and details about the Moon phases. “It takes approximately 29.5 days for the Moon to make one complete cycle. The phases of the Moon are determined by the relative positions of the Earth, Moon and Sun, so the Moon phases are the same for everyone on Earth. The Full Moon rises about sunset. Each night, it comes up about 48 minutes later.” This is an excellent time to do The Moon Salutation. See dates of primary Moon phases, complete Sun and Moon data for one day, fraction of the Moon illuminated, or what the Moon looks like today from the U.S. Naval Observatory. You can also see the Current Moon. In their Astronomical Applications Department, they have another link to Moon phases. Direct from NASA by Patrick Miller. Spectacular images. You have to move around a bit, but you can learn everything you need to know about Moon phases. Space.com presents amazing images - of the moon. The best user-submitted earth and space images. This is always bringing in the latest and the greatest, so it's well worth visiting often. More Moon phases all in one calendar image. Great site. The title of this site speaks for itself. In addition to the Earth, you can also view the Moon from the Earth, Sun, night side, above named formations on the lunar surface, or as a map showing day and night. A related document compares the appearance of the Moon at perigee and apogee, including an interactive Perigee and Apogee Calculator. From the United Kingdom folklore lives! This is where I got some of the information used in this article. It's worth staying here a while to learn as much as you can about the Moon that isn't so readily available on other sites. Thanks to the White Goddess for all the important facts included on this site. I add this at the end because it's fascinating to read about the shadows on the moon. These are the latest Apollo Chronicles from January 2006. Great images, too. That's it for now. As I wrote earlier, there are almost 1.5 million sites about moon phases online today (6.11.2005). There will be many more. If you run across one that is too good to not be on this site, please send me the address. Thanks, and happy landing on the consciousness of the moon.